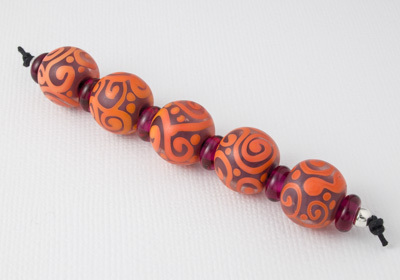 A set of 11 hand made glass lampwork beads, of which, 5 have a purple core with sunset orange scrollwork decorations on the surface. These beads have been finished in the stone tumbler to give them that 'sea glass' texture. There are 6 matching pink spacer beads. The scroll beads measure approximately 14mm in diameter and the spacer beads 4x7mm, all with a 2.5mm diameter hole.